We apologize for the long delay in posting the next installment of Ian’s children’s chapter book, “Jake, Little Jimmy and Big Louie.” Our excuse is that we have been otherwise occupied for most of January and the first days of February because Gayle finally had a surgery date of February 7th for a total hip replacement on the left side. She has had both her right knee and right hip replaced in the past – the knee in 2000 and the hip in 2011. Now she is truly a bionic woman on both sides! Ian is still trying to adjust to a number of changes in his medications and couldn’t be left completely alone while Gayle was in hospital, so we had to arrange for some home care and a LifeLine installation for him. That is going well and we’ve been able to count on the home care attendant to help both of us for a short time after Gayle was discharged on February 9th. Thank goodness for our Canadian health system. So far we have had little additional expenses other than the low LifeLine costs, our pharmacy expenses until the yearly supplement kicks in and our regular monthly BC health payments. Ian and Jimmy, the cockatiel, circa 1999. 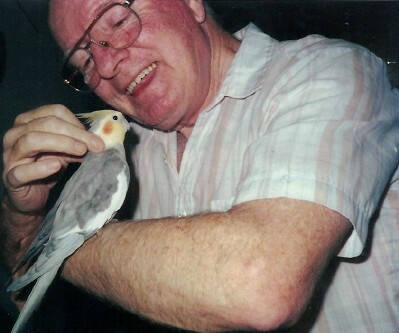 Today we are sharing a photo taken about 1999 of Ian schmoozing with his cockatiel Jimmy, who was the inspiration for this present story about a budgie named Jimmy. We hope you’ll enjoy it and the next chapter of “Jake, Little Jimmy and Big Louie.” If you remember the last chapter, Jimmy had been lost and just as the chapter ends Jake had received the good news that Jimmy had been found and would be returned by the police. Jimmy sitting on Jake’s shoulder. This entry was posted in Biographical info, Blogging, Canadian theme, Children's chapter book, Health issues, self-publishing, Writing and tagged "The best laid schemes of mice an' men gang aft agley. ", birds, boy wanting a pet, budgie, family, feeding a baby wild bird, health, pets, raising birds, Robert Burns quote. Bookmark the permalink. ← Crisis Situations – Am I Happy With the Way I React? No and Yes! I was incredibly pleased to come across this web-site.I wanted to thanks for your time for this fantastic read!! I certainly enjoying every single small bit of it and I have you bookmarked to take a look at new stuff you blog post. How nice of you. Thanks for the Valentine greeting. We send you best wishes for a great Valentine’s day as well. When can we expect to see “ Came To Canada, Eh. “ on the book shelves or by Post ? from a fellow Scot. We were chuffed to get your inquiry. Nice of you to ask. Gayle is in the midst of editing “Came to Canada, eh?” but, as you can imagine, has had a bit of a hiatus at the moment as she recovers from her hip replacement surgery. We hope to get the book into print before the end of this year. In the meantime, we hope you are enjoying the “Jimmy” story.